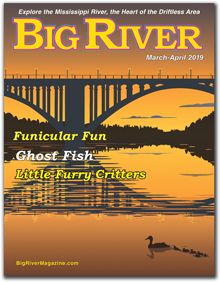 Mississippi River news and stories for people who love the river. We cover both sides of the Mississippi from the Twin Cities to Muscatine, Iowa. Hawks View Cottages & Lodges Fountain City, Wis. Please check out these Big River advertisers when you're in their area. Thanks! Adventure Cycle & Ski, Winona, Minn.
Beach Corners Art Studio, Ettrick, Wis.
Blue Heron Coffeehouse, Winona, Minn.
Bluff Country Co-op, Winona, Minn.
Clements Fishing Barge, Genoa, Wis.
Common Market (FB), Galesville, Wis.
Danzinger Vineyards and Winery, Alma, Wis.
Driftless Books (FB), Wabasha, Minn.
Eagle Hang Gliding, Lake City, Minn.
El Mexican Restaurant, Hastings, Minn.
Great River Brokers, Lake City, Minn.
Great River Road Visitor & Learning Center, Prescott, Wis.
Harbor View Cafe, Pepin, Wis.
Inn on the River, Trempealeau, Wis.
Libertys Restaurant, Red Wing, Minn.
Little Bluff Inn, Trempealeau, Wis. Lock and Dam Eatery, Hastings, Minn.
Midwest Music Festival, La Crosse, Wis., and Winona, Minn.
National Eagle Center, Wabasha, Minn.
Ole Miss Marina, Red Wing, Minn.
Outside the Lines Art Gallery, Dubuque, Iowa and Galena, Ill.
People's Food Co-op, La Crosse, Wis., and Rochester, Minn.
Prairie Moon Nursery, Winona, Minn. Pride of the Nations (FB), Wabasha, Minn.
Red Pines Bar & Grill, Onalaska, Wis.
River Stop (FB), Trempealeau, Wis.
River Trail Cycles, Onalaska, Wis.
Smith Brothers Landing, Pepin, Wis.
Smitty's Marine, Lake City, Minn.
SMU Page Theatre Series, Winona, Minn.
Spasha Salon & Trax Liquor (FB), Alma, Wis.
St. James Hotel, Red Wing, Minn.
Staghead Gastropub, Red Wing, Minn.
Sullivan's Supper Club, Trempealeau, Wis.
Swan Ltd Jewelers, Lake City, Miinn. Turning Waters B&B & Brewery, Wabasha, Minn.